The PCR-4 Quad Pulse Conversion Relay is designed to provide four isolated channels of true Form A to Form C pulse conversion. 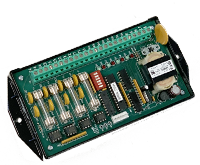 The primary application for the PCR-4 is where four independent isolation relay channel outputs from “sending” meters must be converted from Form A to Form C for compatibility with the “receiving” meters or devices, in one compact package. The PCR-4 may be used with electric meters having electro-mechanical or semiconductor output contacts, either high or low voltage. The PCR-4’s inputs are configured to accept open-collector transistor or open-drain FET solid state pulse initiator switches. Typical applications include interfaces between utility metering devices and customer-owned energy control systems, demand recorder applications, and supervisory control systems (SCADA) interfaces. The PCR-4 relay is designed for high speed pulses and can switch up to 36,000 pulses/hour. The outputs are non-latching. The PCR-4 outputs’ pulse timing follows the inputs’ timing such that output pulses have the exact same pulse width as the input. A bright red LED indicator, one of each input, indicates each channel’s relay status at all times thus allowing a rapid check of the system’s performance without requiring any additional test equipment. The PCR-4’s input and output terminal strip is a “Euro” type connector. When the stripped wire has been correctly installed in the terminal’s “slot”, no conductive parts are exposed on the surface of the terminal strip, thus allowing the user maximum protection from accidental electrical shock. Each “K” lead of the PCR-4’s four outputs is fused to prevent damage to the relays under almost any condition a user might cause such as excessive current, incorrect wiring, etc. 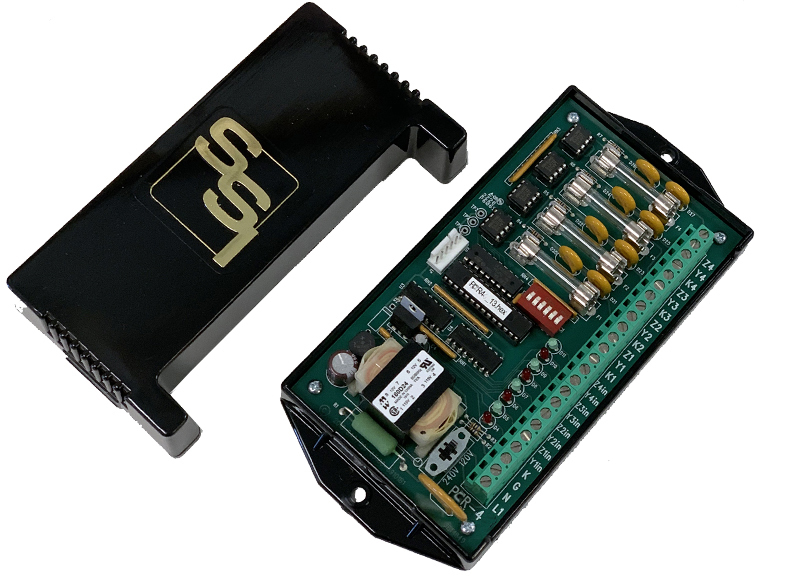 The PCR-4 has built-in MOV transient protection for the solid state relay contacts which eliminates the need for external or off-board transient suppressors. All component parts which have power applied to them, with the exception of the input/output terminal strip are enclosed in a polycarbonate cover for maximum protection. The mounting base plate is also made of polycarbonate and offers excellent electrical insulation between the circuits and the mounting surface. Signal Input: Four independent field-selectable, Form A or Form C inputs. Each input has “Yin” and “Zin” terminals wetted "pulled up" with +13VDC. “Kin” terminal is the common return. 125 VDC input using the DCS-1 Power Supply. Contact factory for other input voltages and special orders.